Bungee running is an activity where participants are attached to a secured bungee cord and run to reach a fixed target.This inflatable bungee run is great fun for children & adults a like.Contenders wear a belt attached to a bungeerope. The name of the game is to place the marker further down the runway than your competitor before the rope springs you back to the beginning. 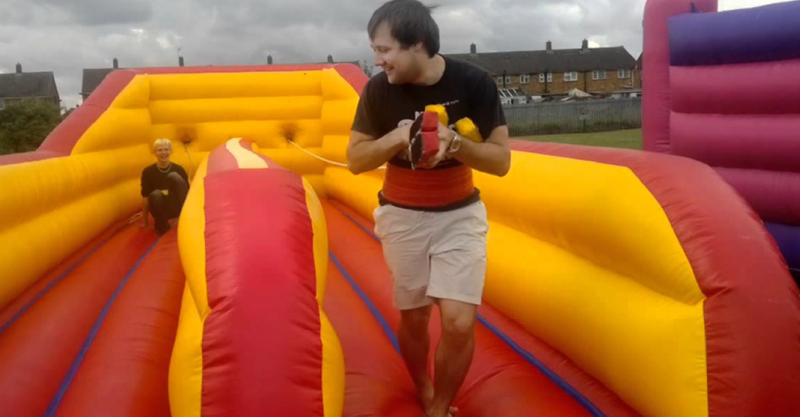 Bungee Run is a great fun way to compete against others, using your strength to pull against a bungee cord attached to your waist in order to reach the end of the ‘bungee lane’ and grab the ‘velcro’ football. With two lanes side by side, this is an exciting, competitive game that can be used at any event or party and also contains areas for branding for you or your clients logos.